It started innocently enough...but then, it always does, doesn't it. I couldn't help myself; once I started to fall, I fell hard. I was once again a woman possessed...barely able to sleep or force myself to do my daily jobs. All I wanted to do was be with my new love. 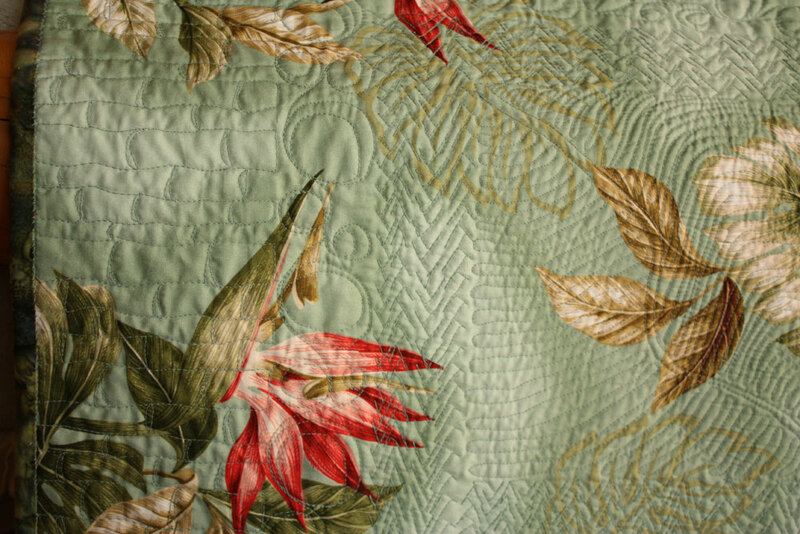 First, I found the bird of paradise fabric on sale. CHEAP. I knew I needed it, I just didn't know why. Then one of my comrades in fabric crimes, Liz, started handing me the batik fabrics to go with it. Next thing I knew, I was spiraling out of control, combing remnant bins for batik scraps, shopping on Etsy for more. The anticipation was building...I soon had enough to get started. 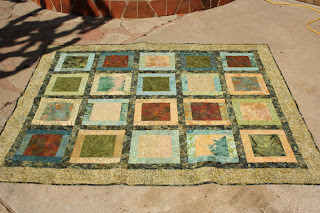 Inspired by a Kaffe Fassett design, I started cutting and sewing. The piecing went pretty fast. 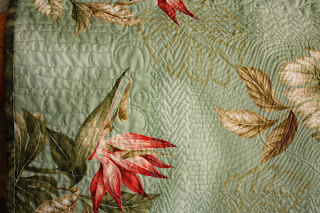 Then I got to the juicy part...the machine quilting. 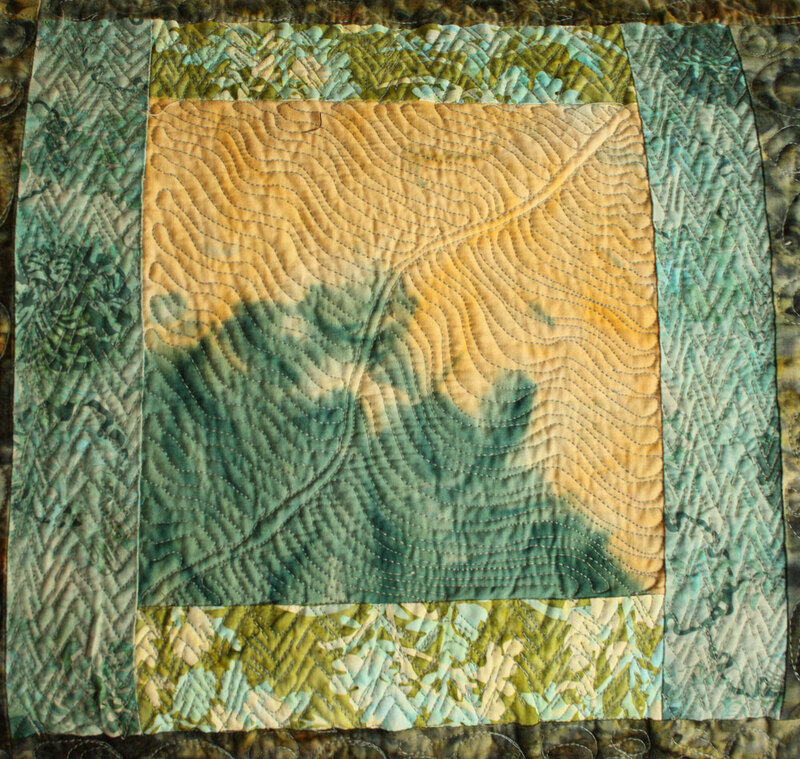 Using some of the free form quilting designs from Leah Day's website, I began with her "rain forest leaf" pattern in the center of each block. I worked like a wild woman, every chance I could. 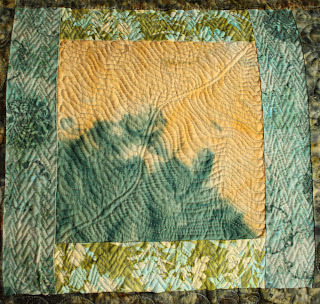 I quilted from the center out, ending with her "bamboo" design on the border. I've included a detail photo of the back so you can see how that came out. I'm super excited. Yesterday, after a few hugs, it was time to part with my love. It went to someone else I love, and will be loved there. What better way to end a great summer? Oh my word!! That is so gorgeous! It must be hanging on the wall in it's new home I'm sure! I am speechless. . What a breathtaking piece!!!!! This must be the year of masterpieces! You talented women just slay me. Beautiful Martie, just beautiful! Thanks, Cathy...I actually hope they really use it! You are an amazing artist with fabric. It is stunning. That is beautiful! I love the fabric combinations. You are so very talented! It's new home is so very lucky! So, how did you do it? Did you quilt from the back of the block? Did you draw the pattern onto the block? I'ld really love to know! It is so incredibly gorgeous! 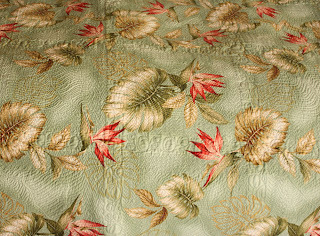 Hi Kate: I quilted it from the top. The designs aren't drawn on, they are free hand but based on little videos I saw on Leah Day's website/blog where she has published over a 100, at last count, free form designs she has created. She's just amazing. Some of what I did started out to be her designs but then I just did my own thing...the rain forest leaf and the bamboo on the border are both definitely her designs.